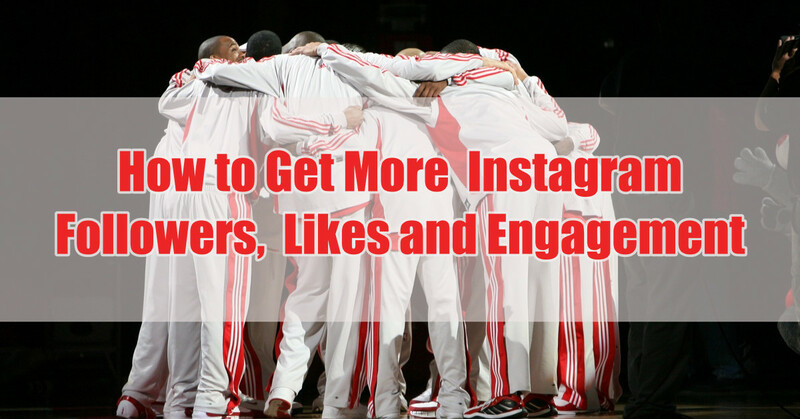 You want your brand to be in the loop, and so you created an Instagram account. Good decision! As the latest statistics would have it, you are now one of the 400 million Instagram users. On this platform, there is a massive visual-centric community of brands and consumers sharing over 80 million photos and videos every single day. That is too many numbers to take in, isn’t it? 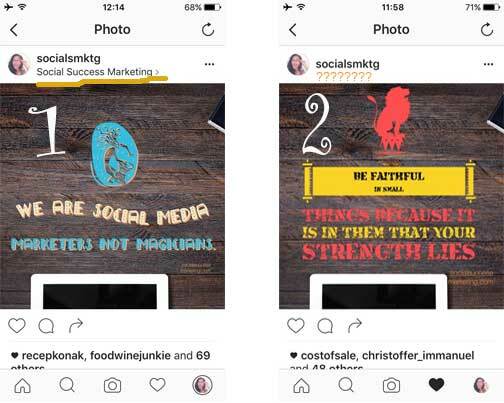 No wonder, Instagram has become one of the top social media sites for businesses. Did you know that? There are solid reasons why. For one, marketers made this app a place to efficiently display their brands through highly cohesive visual content. It is good news for those inclined to express their artistic flare through quality images and videos. One more thing. It has been said that IG is dubbed ‘king of social engagement.’ Forrester analyst claims that the IG’s per-follower engagement rate for brands is 58 times higher compared to that on Facebook, and it is 120 times higher than Twitter. Oh yes. You cannot argue with statistics. So now that you are on the right platform, what do you aim for the next? FOLLOWERS AND ENGAGEMENT. Fans that engage. The truth is, and you know this if you have stayed done social media long enough like we have been dong, it ‘s hard to build a huge following for your brand without sweating it out. For start-up and new small businesses, it takes dedicated time and intentional efforts to grow a following. However, it does not mean it cannot be done! Why? Because it can be done! Put them in the caption section of your post. Hashtags are one-way other IGers can find you on Instagram. In fact, the search tool enables hashtag search. Also, I always make sure I set my profile to public so my posts will be visible in the corresponding hashtag page. How do I use hashtags on Instagram? I check if hashtags I use are OK (no negative association nor implication). I also check the number of posts for a hashtag that I intend to use. 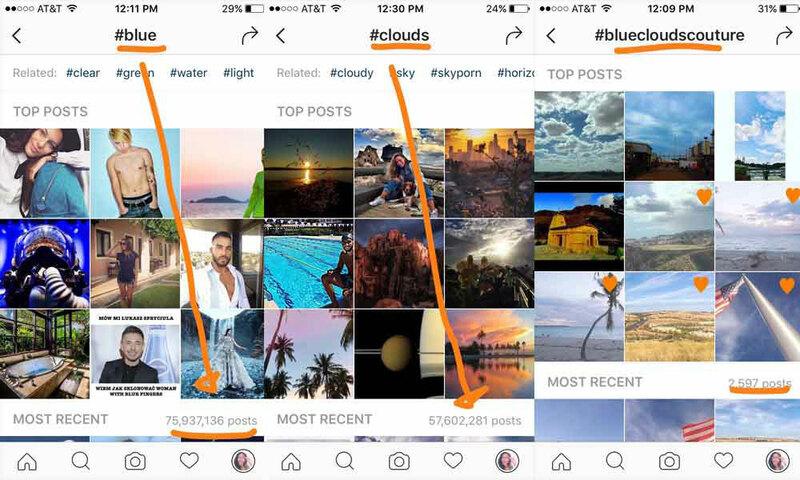 Potential hashtags would be #blue and #clouds: the latter has 57,602,281 posts while the former has 75,937,136 posts as of this time of writing. There’s too much competition there for a non-famous IGer like us here at Social Success Marketing. That said, we included #bluecloudscouture which has 2,597 posts only. The images with the heart as top posts are from us. 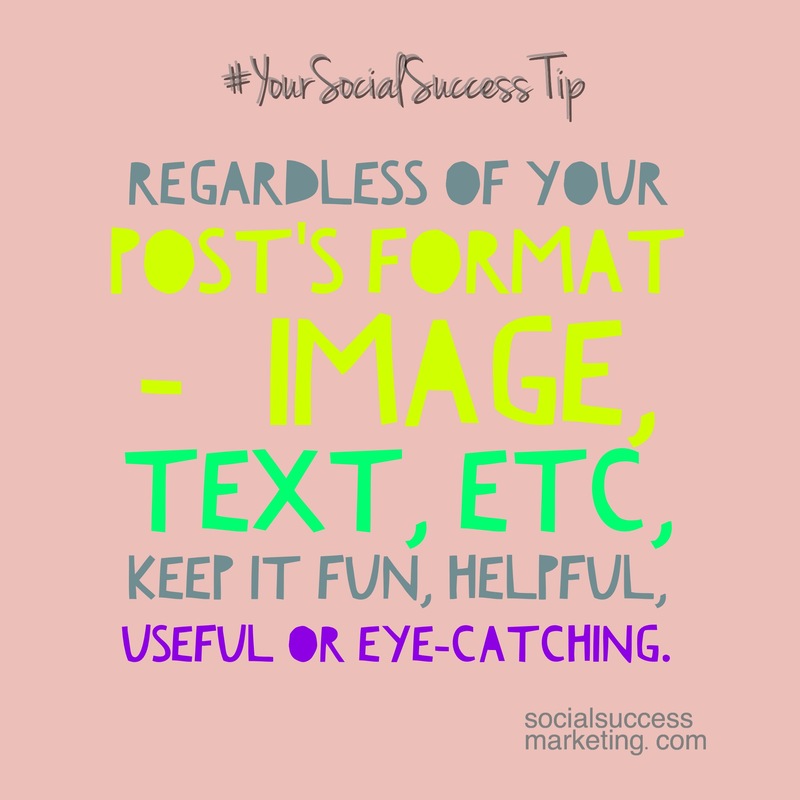 Include 2-3 word hashtag that is not generic if visibility is one of your key goals. Include 2-3 word hashtag that is not generic if visibility is one of your key goals. Click To Tweet You can use up to 30 hashtags, but it is a good practice to use proper hashtags that are significant to your goals and your brand. Your hashtag should have your brand’s unique ring to it so it will not overlap with other brands. You know you can use up to 30 hashtags, right? Use it well, though. It is good practice to use proper hashtags that are about your goals and your brand. Your hashtag should have your brand’s unique ring to it so it will not overlap with other brands. Remember that your goal is to be visible, hence use hashtags! Ever wonder why IG has filters? To  make ho-hum pictures look like high-end shots. It is calling for high-quality images. If you are not gifted with an eye to shoot good ones, pick a filter that would enhance your photos. Thankfully, IG has about 37 different filters, as of this time of writing, and so you can select many options to style your content and make it look its best. You can use these filters to lighten underexposed photos, darken overexposed ones, put warm hues or add a vintage look, etc. However, in representing a brand, you should choose the same features across all your images and videos for consistency. Don’t be afraid to experiment on your photos to see which ones generate a high engagement. Also, take note of Instagram’s format for images (1080px by 1080px) to avoid an awkward crop. High lightness generates 24% more likes than dark images. A high amount of background space generates 29% more likes than those with minimal space. Images featuring blue as the dominant color generates 24% more likes than images that are predominantly red. A single dominant color generates 17% more likes than images with multiple dominant colors. High levels of texture generate 79% more likes. Add place to your images. Who would have thought that just by adding location to an image that it will drive 79% higher engagement? Yes. It certainly does! Take advantage of this IG photo map feature. Adding a location to your photos is a sure and cool way for followers interested in a particular place to see your photos. Tried it yet? Not sure what I mean? Image 1 below is tagged with our office address; image 2 is not. 1. Click the three dots (which is left of my IG handle). A few options will appear. 4. Pick the place where you want your image to appear. 4. Speak with others while there. Relationship building takes time unlike merely automating or dropping posts, then leave. You cannot expect engagement from others when you do not engage. One rule in social media is reciprocity. The more you engage on a daily basis, the more you build rapport with others. Be interesting, but you have to be interested in others as well. 5. Seek out people to follow using the search function. It is not enough to look for followers in social media. It is, also, a good idea to surround yourself with people who can inspire your creativity and challenge your wits as iron sharpens iron. Search for people and brands whom you think highly of and aspire to be. Also, follow your business partners, best customers and staunch believers of your brand. Roll up your sleeves. Get moving! If you are feeling you need a push, don’t hesitate to give us a call. Any other tips you would like to share on how to grow followers and engagement on Instagram?